If you feel like you’ve been stuck repeating the same problems over and over or lost in endless distraction, don’t worry. That may just be a signal that it’s time for you to embark on an exciting new path of self-evolution. Reflect taps into your unique human capacity for accessing meaning, presence and wisdom in 108 inspiring, affirming, and illuminating reflections. You’ll journal, reflect, and practice, to discover the wonder and stillness of presence that exist for you, not tomorrow, but in this next awakening moment. This book is a masterpiece. It is bound to become a classic for those of us who are serious about the business of true awakening. It is also a breath of fresh air. Donald Altman knows how to formulate the deepest wisdom with such an easy, tender and compassionate touch. And a wildly funny remark is never far away! I love this book already and know that it will inspire me for years to come. With tremendous craft Altman is able to awake the reader to the brilliancy of this moment. As he puts it, “The mind is like a wild mustang that will kick you unless trained.” This is the clearest, most poetic and most practical book on mindfulness I have seen in years. A lasting gift! Reflect skillfully combines wisdom and humor, and I found myself not only reflecting but laughing at times, which drives the point home really well! The profound insights are accessible to everyone. I loved this book. Donald’s wonderful book Reflect offers insightful and mindful “reflections” on the most important aspects of our lives. In our relationships, we should see partners, friends, and relatives with fresh eyes. Love involves the mindful deepening to the richness and subtleties of our connectedness. We should lighten up and enjoy laughter and humor so that we can truly open up to the here and now. In a series of poetic aphorisms, Donald Altman caresses the topics of simplicity, peace, love, and bliss to illuminate the stuck places in our psyche and bring us home to our deeper selves. Reflect is truly magical. Serenity is closer than we think, no further from us than the pages of this gem of a book. Every reflection within is an opportunity for heightened awareness, an open invitation to embrace life’s journey without mindless distraction, reveling in those spaces between thoughts, where we are inspired to receive the light of discovery and can reflect on the blessings of our truest, most pure and profound nature. Reflection is a process of taking stock of yourself and where you stand in the world. As simple as it may sound it takes practice to develop the habit of practicing reflection. 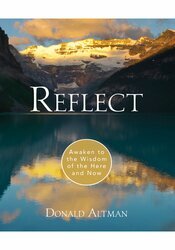 Fortunately, Donald Altman’s newest book, Reflect, provides insights into how you can make reflection a habit. Doing so will energize yourself as well as make you more aware of how you deliver your best to others.